Is the season slipping away from the Reds? It’s an old picture, but that expression pretty much sums it up. Toward the end of June, the baseball season starts to take its toll. I’m not talking about the players, though that may be true as well. I’m talking about me. Many nights the chance to go to the frozen yogurt stand, drink beer during a free summer concert, or (in the case of these Pacific time zone games) go to sleep before dawn somehow just makes it seem less necessary to pay super-close attention to the Reds. Come January, I’ll find it hard to believe that I ever felt this way. As if the mid-season doldrums weren’t enough, the Reds are also going through a rough patch right now. They’re 4-6 in their last 10 games. Sure, the Cardinals have also gone 4-6, so the Reds haven’t lost any ground on them, but what about these Pirates? Those guys have put together an 8-2 performance and pulled themselves even with the Cards, leaving the poor Reds 3.5 games out. The Reds are the defending NLC division champs, and I wondered how this season was looking compared to that one. Amazingly, despite how crummy it feels right now, the Reds actually have 4 more wins than they did on this date last year. In 2012: 41-34. Today: 45-34. I guess it isn’t the Reds who have changed, so much as the division competition. What the hell is up with these teams? Last year the Pirates were 40-35 and the Cards were 40-36; today they’re both 48-30. A 62% winning percentage almost halfway through the season?? This just isn’t fair. Even though the Reds are 3.5 games back and in third place their .570 record is bested in all of baseball only by the Cardinals, Pirates, Red Sox, A’s and Rangers. What a treat that the Reds get to face one of those teams this very night when they visit the Rangers. I might go get frozen yogurt. Wake me up when the Giants get to town. Comments Off on Is the season slipping away from the Reds? The Cincinnati Reds were swept by the Oakland A’s in their two-game series, the exact opposite of that great 1990 World Series. The loss drops the Reds’ record on the road trip out west to 1-4. There were no stars of the game for the Reds. It was a terrible, uninspired, and boring game from start to finish. Homer Bailey got the loss, giving up 4 runs over 6 innings. He struck out 7, which was nice, but those 4 runs. Ouch. Not that it mattered. Even if he’d shutout the A’s, the Reds still would’ve lost. The bullpen gave up one run over its 3 innings. But the offense continued to fail to show up. In 9 innings, they managed no runs and just 2 hits. The lack of passion the Reds have been playing with lately is difficult to watch. I hope they can turn it around. It’s no longer early. After almost two months recovering from a hamstring issue, Chris Heisey has been activated and is back in the lineup as the designated hitter against the Oakland A’s tonight. 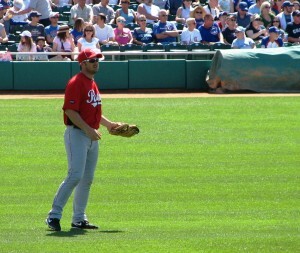 Heisey had been playing games with the AAA Louisville Bats for the last week, going 4 for 20. 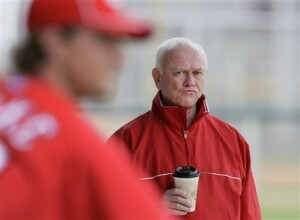 Donald Lutz was sent down to AA to make room for Heisey’s return. Heisey will be back, but the Reds will be without star second baseman Brandon Phillips, who was placed on the paternity list. I didn’t know that was a thing, but it’s apparently been there since 2011, added at the same time as the concussion list. Players can miss one to three games, and Phillips is expected to miss the two-game series against the A’s. Infielder Henry Rodriguez was called up from Louisville to take his place. Yesterday, the Cincinnati Reds didn’t play baseball. At least, I assume they didn’t. With them being on their first west coast trip of the season, the games start so late that I could easily miss them. The Reds have been struggling lately, which is never how you want to see them when they’re heading out west. My, there’ve been some seasons lost out west. That won’t happen this year; this team is too good. But after losing 2 of 3 in their first road series against the Arizona Diamondbacks, one has to hope the day off will help erase the jet lag that often accompanies the games in time zones other than central or eastern. 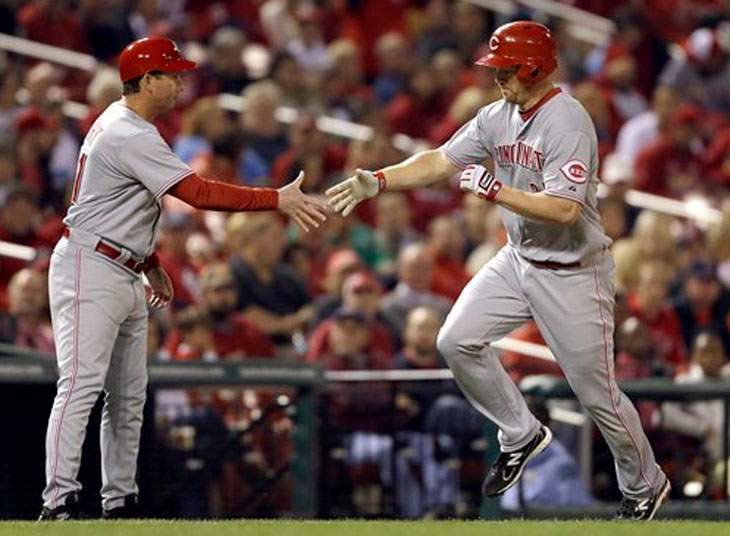 The Reds will have a short, two-game series against the Oakland A’s this evening. Bronson Arroyo will start and try to right the Reds’ ship. The A’s have been a good team this year, although they’ve been losing a lot lately. Hopefully, the Reds bats will be rested enough to score so many runs so that no bullpen mishaps can doom them. Or, hell, let’s go crazy with hope and think the bullpen is well-rested enough to put its crappy outings behind it for a week or two. We won’t know until 10:05 pm tonight. Until then, see how well you know Corky Miller with the Cincinnati Enquirer’s quiz. 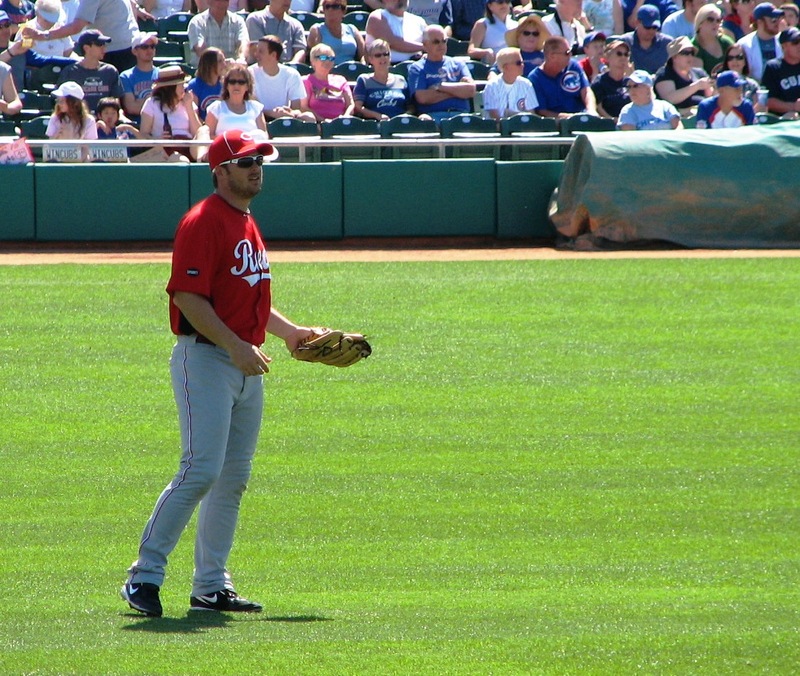 The third base coach for the Cincinnati Reds, Mark Berry, was diagnosed with cancer during spring training. The treatment for the cancer in his left tonsils and lymph nodes was so strong that it forced him to take a leave of absence from his duties with the Reds. I’d been wondering how the treatment has been going, but there haven’t been many updates. Reds beat writer Mark Sheldon took care of that today with a nice, in-depth profile of Berry’s new life with cancer. Berry decided against the more invasive surgery and opted for chemo and radiation. He hoped to work home games at night as the bench coach, since he would be getting treatments at University Hospital during the day time. Bench coach Chris Speier moved to the third-base line during camp. The reality soon set in that it would not be possible for Berry to work at all. The idea of trying to work in a professional sport while getting chemotherapy seems ridiculous in hind-sight. I’m glad that approach was quickly abandoned, allowing Berry to focus on nothing but getting better. And it sounds like the treatments have been effective. While the treatments are over, the cloud of cancer is not gone from above Berry’s head. He is scheduled to undergo a final PET scan on Sept. 4 to determine if the cancer is gone. If it’s not, surgery would be a potential option. Right now, things look good. The feeling of marbles in the lymph nodes is gone and Berry said a scope already showed doctors that the tumor had been greatly reduced. The burnt skin inside his throat is turning into new skin again. I would recommend reading the entire article. Berry’s gone through a terrible time, but it looks like things are improving for him. I do hope he gets to return to the third base coaching box later this season and gets to high five Reds players as they round third after a home run.